T’ai Chi has physical, mental and spiritual aspects. The gentleness of T’ai Chi ensures that the practitioner does not suffer the kinds of strains or muscular and joint injuries which are common with more physical types of exercise, but develops greater strength while developing greater flexibility and suppleness. Dedicated athletes will find that T’ai Chi is one of the finest ways of gently warming up to offset any vigorous exercise that may follow and it can help to speed up recovery from injury. The nervous system is soothed and calmed which can help aid restful sleep. In China T’ai Chi is often practised as a Health Art because it has been known for centuries to aid recovery from a variety of diseases especially those caused by stress or overwork, and it can also benefit anyone suffering from overweight as it helps to break down the fatty tissue in the body thereby reducing the body to its natural weight level. T’ai Chi is also very good for the balance, and the deep breathing exercises improve oxygenation in the entire body and help to increase stamina. T’ai Chi can help to sharpen the mental faculties and improve acuity so that a very strong and purposeful mind is developed. Dynamic and exact control is maintained over all parts of the body and by this means one also learns to keep control over the emotions. We also learn various partner exercises which provide a unique opportunity to learn how to utilize and develop internal energy as well as learning practical methods to stay focussed and relaxed in stressful situations. T’ai Chi is based upon the ancient Chinese philosophy of Taoism. Although Taoism is not a religion, studying T’ai Chi can have spiritual benefits by helping us to become more aware of how we are a part of the natural world. By learning how to control the emotions you can start to develop a deep inner peace thereby becoming at one with oneself and others around you. This naturally leads to a greater awareness and understanding of oneself, and a greater appreciation and understanding of others, all of which creates a balance and harmony within oneself and with the world around us. For centuries Taoist scholars, doctors and herbalists have investigated the inner workings of the mind and body. Documents and drawings uncovered from burial sites at Mawangdui in China show us that exercises which are recognisable today have been in practise in China since at least 168 BCE. Written texts which are still in use today such as the Nei Ching or Yellow Emperor’s Classic of internal medicine have been traced back to the Xia dynasty of 2600 BC. Many Taoist works on subjects such as philosophy, science, medicine, alchemy, astronomy, and agriculture, have survived into modern times. Through dedicated research and experimentation the Taoist philosophy of yin and yang was evolved, but above all it was discovered that each individual’s mental and physical health depends upon the quantity and quality of their internal energy or life force known as the ‘Chi’. All modern forms of Chinese Medicine such as Acupuncture, Acupressure, Herbalism, Taoist Yoga or Chi Gung, and T’ai Chi Ch’uan are derived from these earlier studies. The major emphasis in Chinese medicine is on prevention rather than cure. Exercise, lifestyle and dietary habits are of primary consideration. From early times Taoist doctors found that natural foods and deep breathing exercises could help the body to store energy rather than depleting it. Rather than treating disease after it had struck they decided to encourage people to take a more responsible and active role in their own well being. They developed T’ai Chi as a popular way for people of any age or level of ability to improve their health and to aid their recovery from illness from the roots by cultivating the Chi. More recently, as Chinese people have emigrated to other countries, T’ai Chi has become popular throughout the world as an antidote to the increasing pressures of the urban environment. Sometimes called moving meditation the gentle movements can be practised by young and old alike as there is not the wear and tear on the body associated with more aggressive forms of exercise. Deep breathing and stretching exercises are also incorporated to help rid the body of toxins, but the most obvious benefit to most people is the deep feeling of relaxation which accompanies the practise. T’ai Chi has become the living embodiment of a philosophical tradition which has been directly transmitted from teacher to student often without recourse to written or oral teaching. Students are encouraged to observe the laws of nature at work spontaneously through their own experience rather than copy something which they have been told or read in a book. 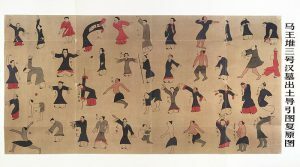 Taoist teachers often integrate their studies with other related disciplines such as K’ai Men or Taoist Yoga, Wu Shu or self defence practise, Ch’ang Ming or natural dietary therapy, and the many and various aspects of Taoist medicine and meditation techniques. T’ai Chi exercises can be practised anywhere as there is no need for any elaborate equipment, all that is needed is some space, some clean air, and a little time each day. With dedicated practice and an open minded attitude it is possible for anyone to feel the flow of their internal energy and thereby take the first steps along the road towards a lifestyle which integrates the physical, mental and spiritual aspects of their being. The TCAA run weekly T’ai Chi classes and weekend courses throughout the UK and Easter & Summer course in Cornwall. T’ai chi is a gentle form of exercise for health and relaxation which originates from ancient China. Gentle flowing movements are combined with deep breathing exercises in order to cultivate the inner energy of the body or chi. 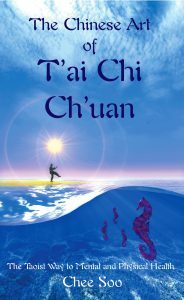 Chee Soo wrote a comprehensive and detailed training manual for students who are practising the Lee style called The Chinese Art of T’ai Chi Ch’uan. This book has sections on all of the basic exercises for T’ai Chi practise including stances, sticky hands, whirling arms, whirling hands and advice on the best ways to train. It also tells us about the history of T’ai Chi and the development of the various styles. Although this book is suitable for beginners it is also full of information which will be of interest to the more advanced student. If you are interested in reading more you can obtain a copy by clicking on the image. If you would like to read more then you can order a copy from Seahorse Books.